These glorious, late October days have been busy ones in the garden! Instead of cool, early mornings in the garden, I have been spending the warmer, afternoon hours gardenkeeping. 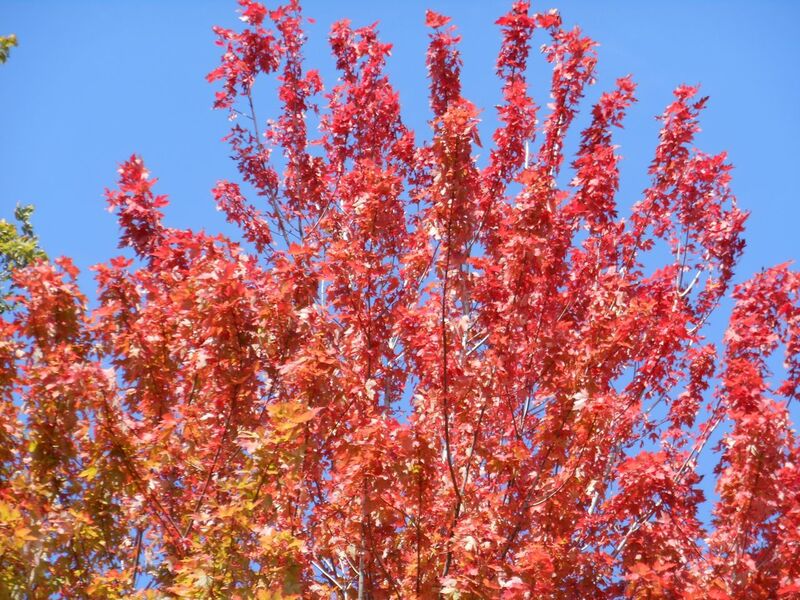 Our ‘Autumn Blaze’ Red Maple is in full color now. What a joy to look skyward and take in her glory! Her leaves are fluttering down and we will be raking very soon. 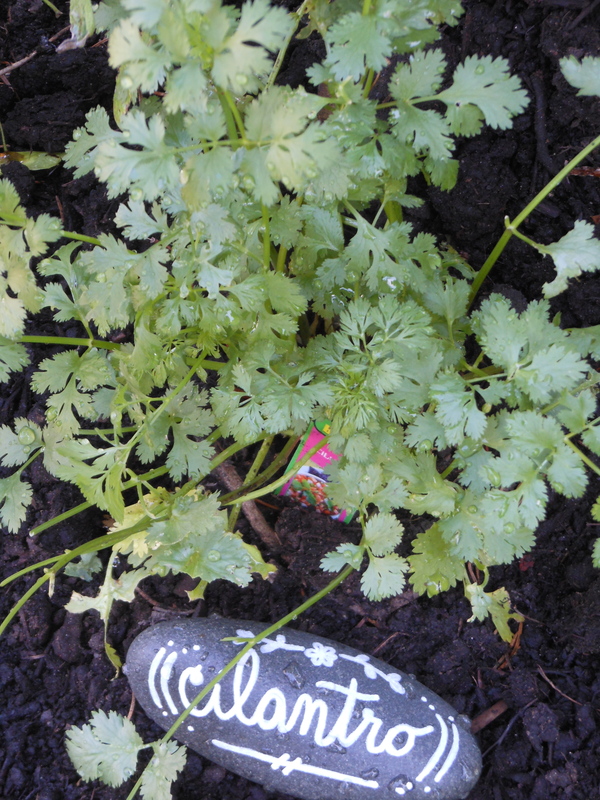 I have been harvesting herbs to add the warmth of summer to our winter soups. 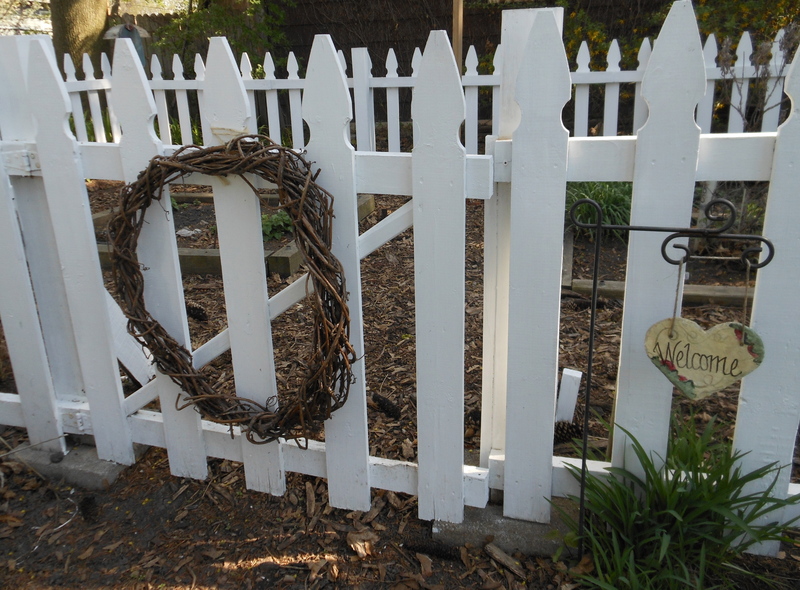 On Saturday, we worked together to give the white picket fence around the Herb & Tea Garden a fresh coat of white paint for the snowy months ahead. This big task was actually enjoyable, as we worked together. My husband painted along the outside, while I painted the inside. Fascinating conversation mingled with the wonderful scent of herbs. A frisky squirrel entertained us from the branches of a nearby tree, while Maple seeds twirled down around us. Very tired, but happy, I finished cleaning up just as darkness fell. Today I gathered bunches of Lacecap Hydrangeas to dry. What fun it was to add color from my perennial gardens to my little ‘Paper Garden’ studio downstairs! Dried flowers and herbs from the past three summers hang from the ceiling rafters over my creative papercrafting space. They truly fill my heart with inspiration as I create! I feel so blessed to be able to enjoy time in the ‘garden’ all year long! 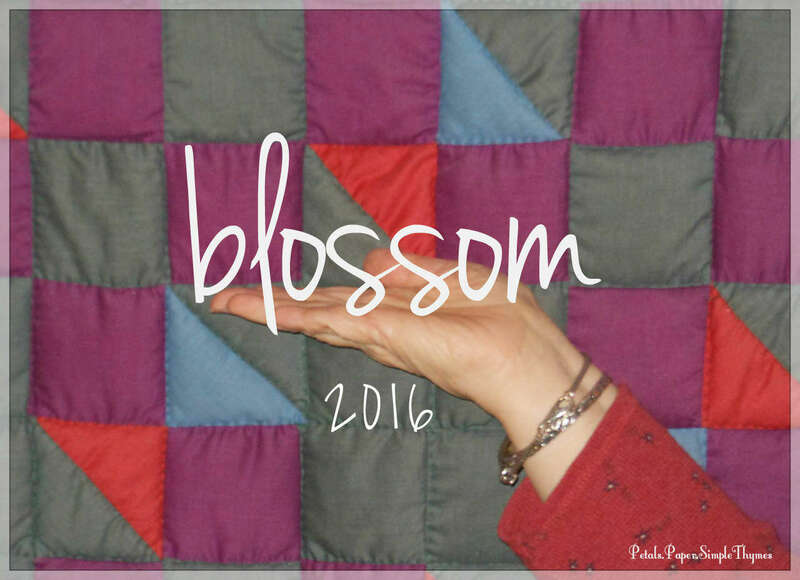 As I reflect back on this year’s gardening season, the word that comes to mind is change. 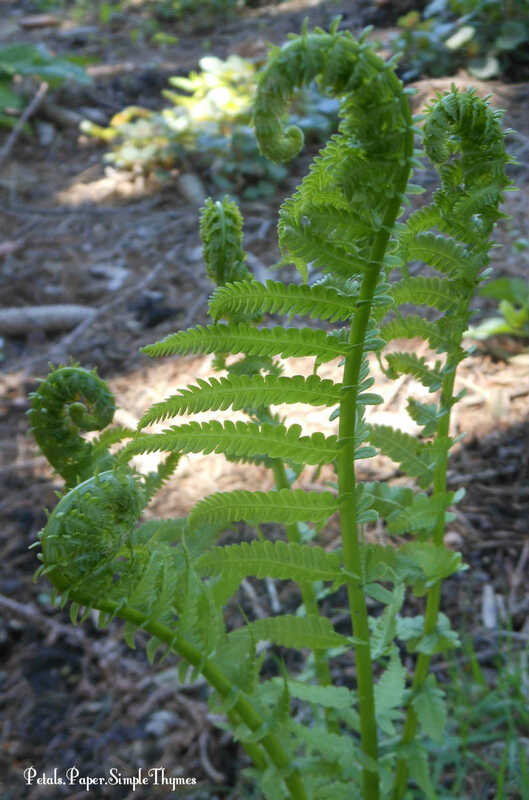 Mindful, intentional changes have kept me busy in the backyard for many weeks. I’m already planning big changes for the perennial beds in the front yard next year. My gardener’s heart tells me that it is time to ‘right size’ my flower gardens. 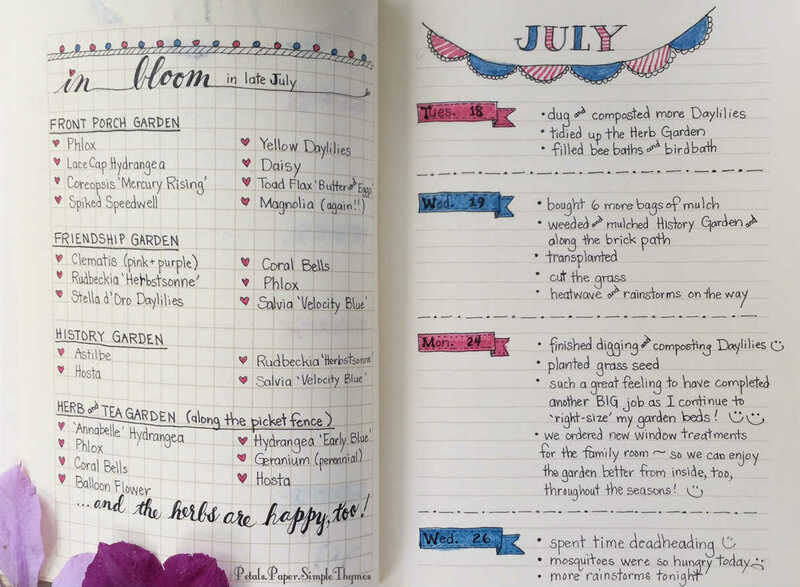 Although change is never easy, I’m already making plans for a new look in the garden… and I’m excited! 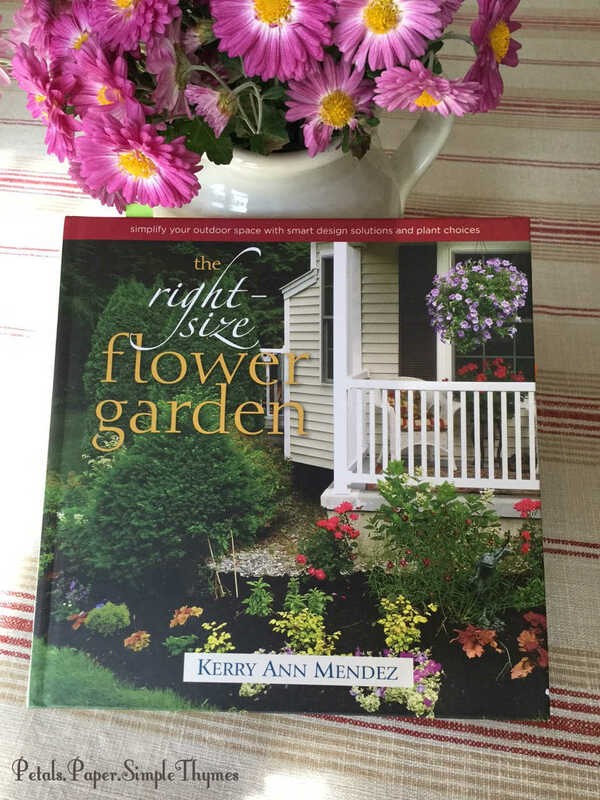 The Right-Size Flower Garden, by Kerry Ann Mendez, caught my eye last year on a ‘New Books’ shelf at the library. Within the first few pages, I knew that this book was speaking to my heart! It definitely passed my ‘spark joy’ test, so it was a valuable addition to my own gardening library. 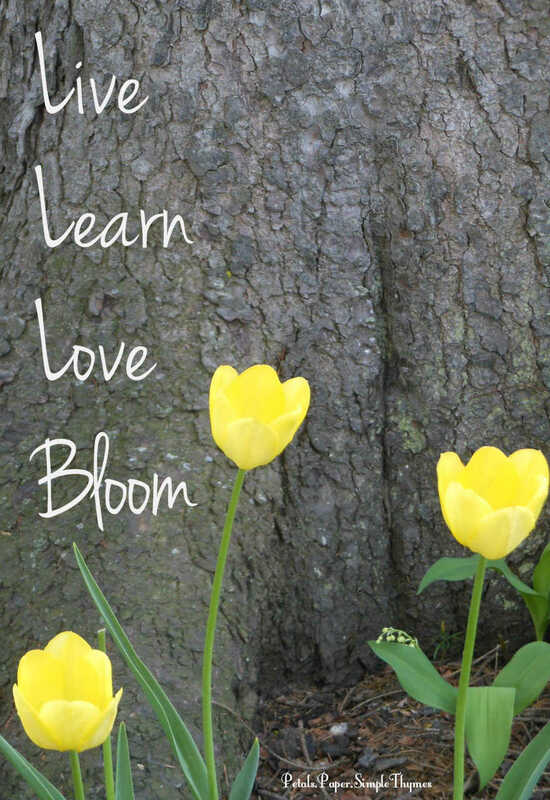 A garden author and lecturer, Kerry Ann shares her advice with the perfect blend of practical experience and her delightful sense of humor, as she guides us step-by-step to create a garden in balance with our lifestyle. 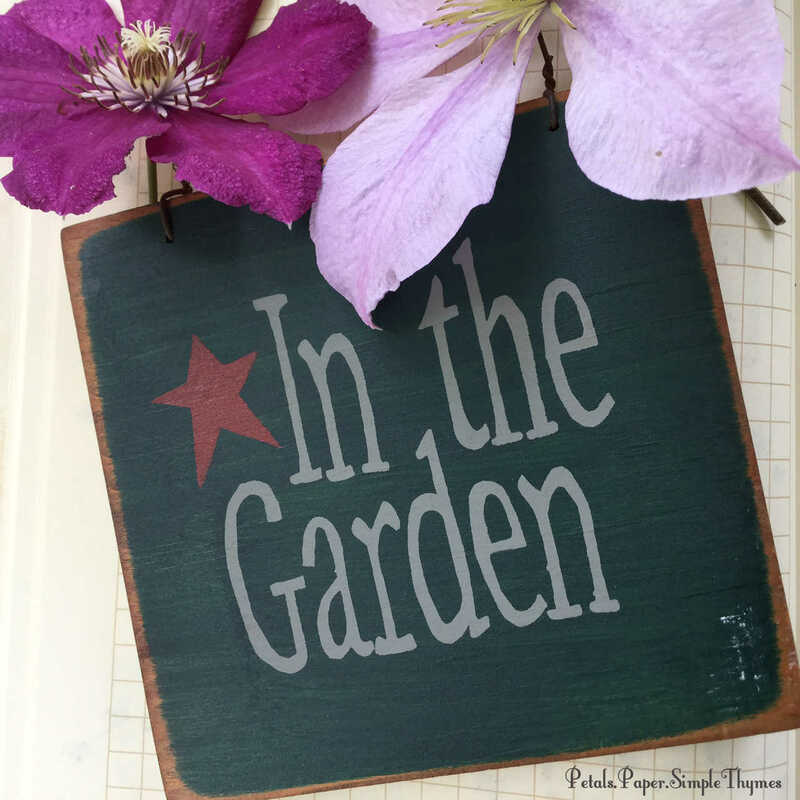 As I read, I often found myself nodding in agreement, as the author shared her own stories of the changes in her garden. 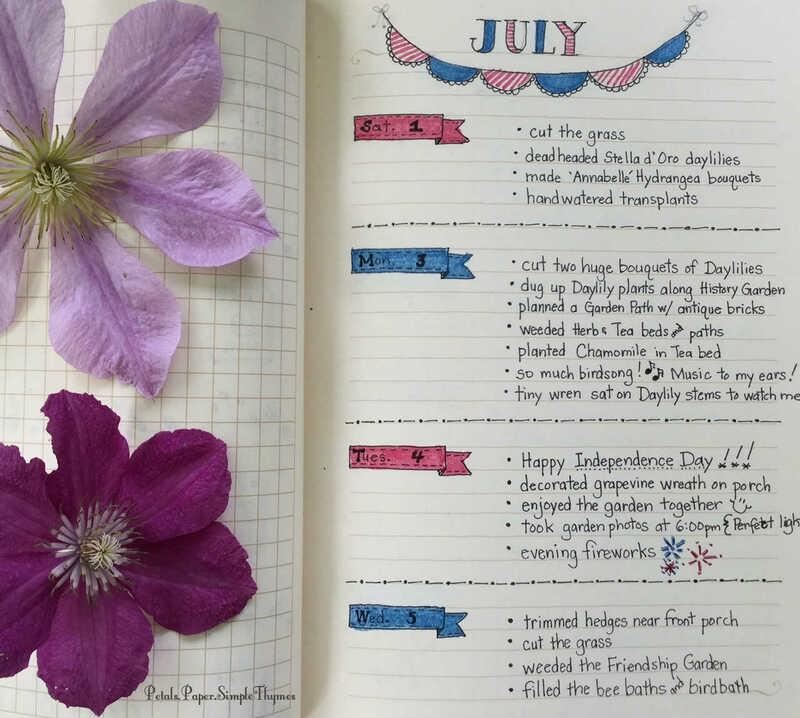 Kerry Ann reminds us, “To reduce work by 50%, then at least half of your garden will require editing.” She shows us how to edit our gardens using her “Three R’s” approach. 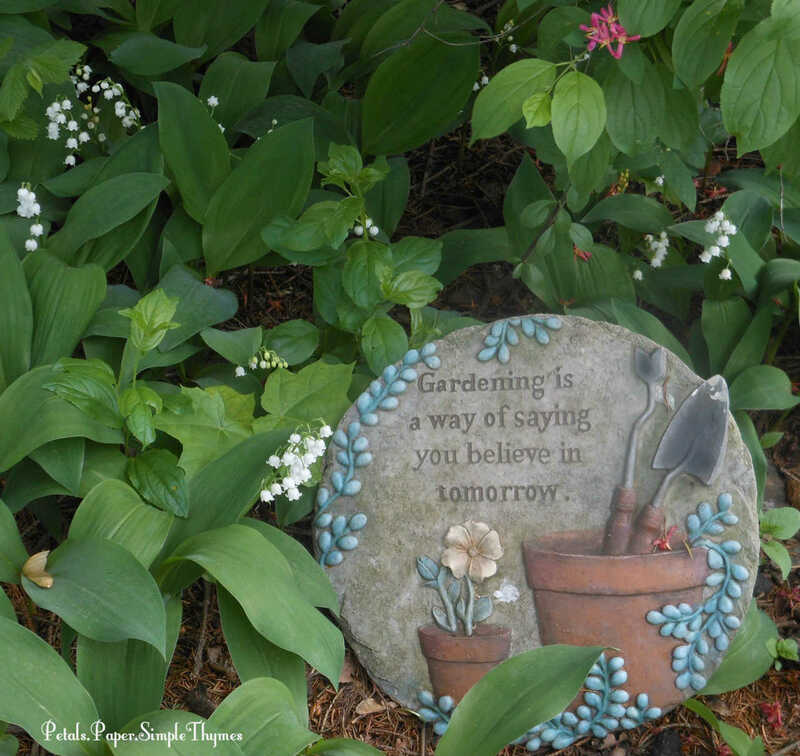 Kerry Ann’s advice has been so helpful as I decide which garden beds will “Remain, be Revamped, or be Removed.” She assures us that the changes will be exhilarating, as the Refinement of our gardens brings us Relief and Relaxation. Beginning the process of ‘right-sizing’ my perennial gardens this summer was a huge first step for me. My very favorite, old-fashioned flowers and those with sentimental value found new homes in my Herb & Tea Garden and my History Garden. These plants will continue ‘spark joy’ for me in the garden. My large Cutting Garden bed is now gone and the newly planted grass seeds are already creating a carpet of green in its place. It will be so much friendlier to mow a little more grass, instead of weeding the large Cutting Garden bed. I am already feeling a sense of relief! Removing a large patch of orange Daylilies along the garage to create my ‘History Garden’ was a real challenge. Digging up the plants was a test of physical stamina, while it was emotionally difficult to toss away so many beautiful, healthy plants. I just kept repeating Kerry Ann’s mantra ~ “These are not children or pets.” If you crept up behind me as I was digging, I’m sure you heard me! I felt so grateful for Kerry Ann’s permission, wisdom, and guidance to begin these big changes! The Right-Size Flower Garden has also been a wonderful resource of suggested plants for each part of my garden. 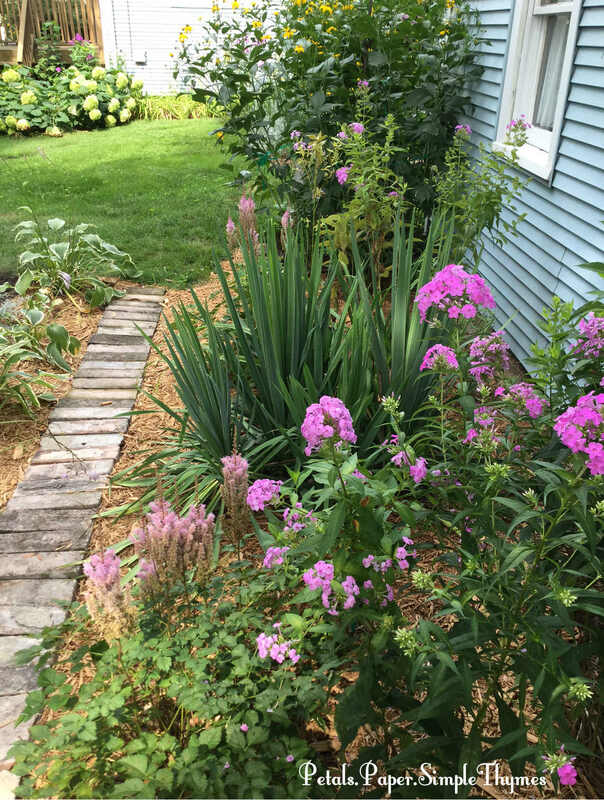 I have learned more about the plants that I have grown for years and have many ideas of ways to replace these high-maintenance plants with low-maintenance alternatives. I can’t wait to try her recipe to rid my grass of Creeping Charlie (a perennial weed, also called Ground Ivy) next Spring! I will be sure to report back with the results! 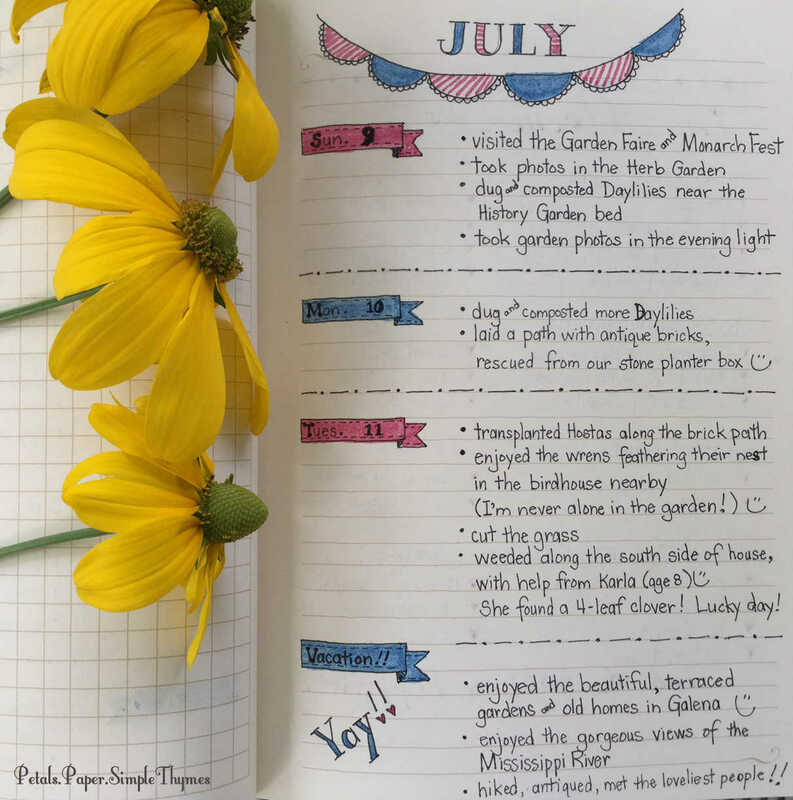 The Right-Size Flower Garden is a delight to read (and reread!) and a valuable resource, as we design gardens that provide color, fragrance, and privacy with drought-tolerant perennials, shrubs, and trees. While the 2016 gardening season is still fresh in our minds, it’s the perfect time to be mindful of what worked well and what could be better in next year’s garden. Over the winter months, I will reread this book leisurely, with a cup of tea, as I plan more garden changes with intention. 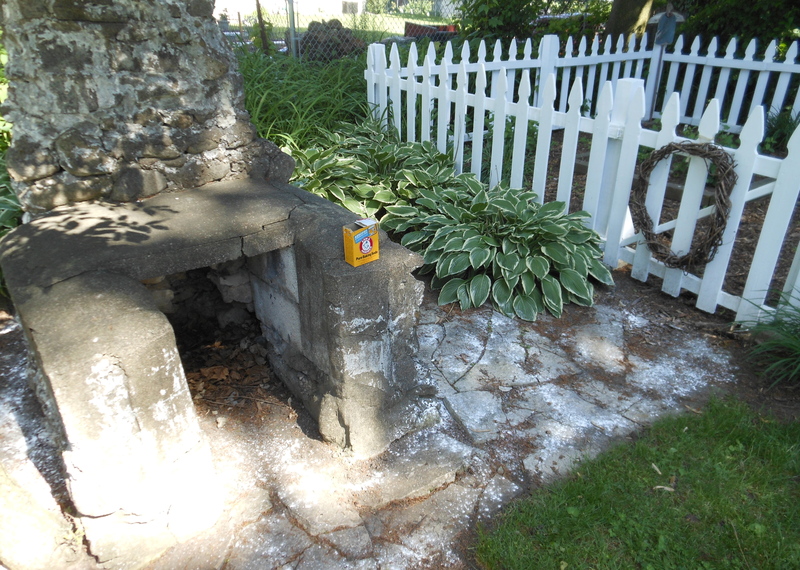 It holds the seeds of inspiration for “Refinement, Relief, and Relaxation” in my beloved perennial gardens! Have you been thinking about any changes in your garden? Hope you will share your thoughts with us! and a wonderful start to November! Hope you are enjoying these late summer days in the garden! Here in the Midwest, the first week of September brought us a real heatwave. Yet it still feels like summer is coming to an end much too soon. Although the garden is filled with bright color, the light is different now, the foliage is looking a bit tired, and the ground is very dry. We are hoping for a little rain to help the garden thrive in the weeks to come. This morning, I danced into the garden very early hoping to avoid the afternoon heat. What a treat for the senses! I was mindful as the birds sang sweetly and the cicadas buzzed louder and louder. Butterflies fluttered from bloom to bloom in the gentle breeze. Oh-so many bees buzzed about doing their important work. The sweet fragrance of the blossoms drew me closer. The morning sun felt warm, rather than hot and sticky. Although there was much work to do, I spent a few moments just ‘being‘ in the garden. So often, we are too busy ‘doing’ in the garden. In these precious moments, under the wide, shady brim of my straw hat, my eyes were smiling and my heart was singing! 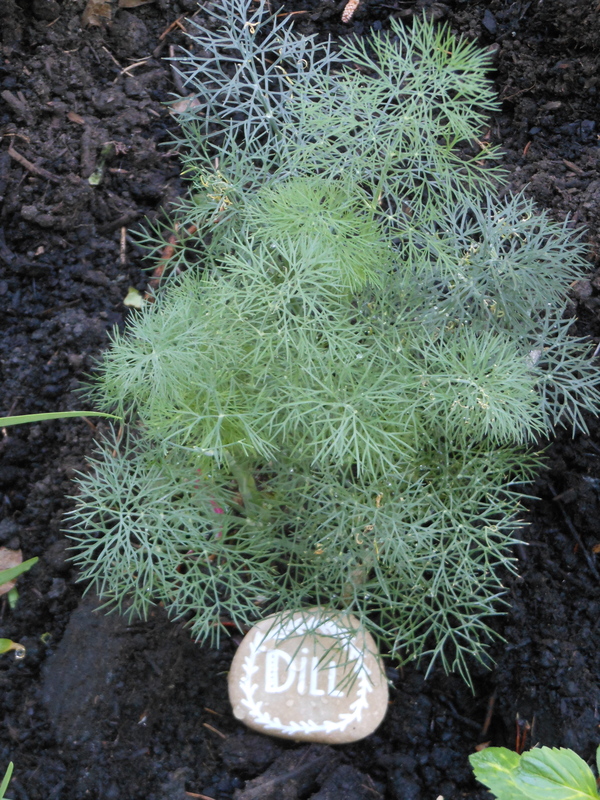 Soon, gardenkeeping called and I set to work transplanting a small Blue Mist Bluebeard shrub. The mother plant has been a lovely part of our front yard for many years. 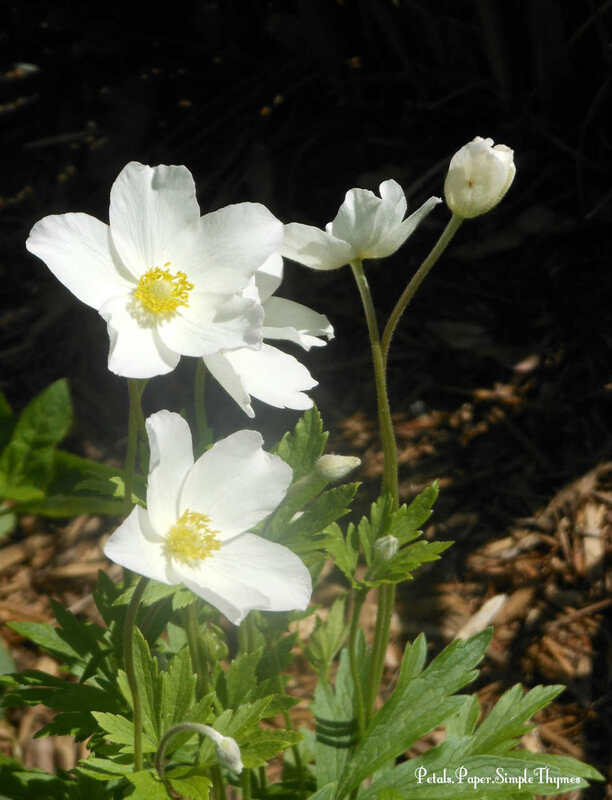 It was a gift of friendship from Candy’s garden and has survived our harsh, snowy winters here in USDA Zone 5. 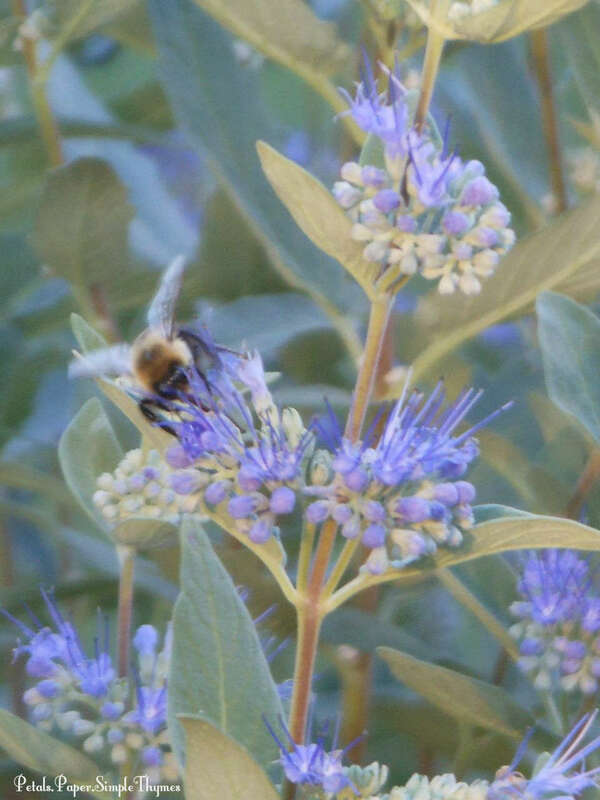 Every year, in late summer, this shrub rewards us with beautiful blue flowers and a heavenly fragrance. Best of all, it is just filled with bees! Each time I pass, I notice an abundance of bees landing on almost every stem. They are practically waiting in line for their turn! Two years ago, we discovered five baby Blue Mist Bluebeard shrubs growing in a raised bed about eight feet away from the mother plant. Oh the joy!! 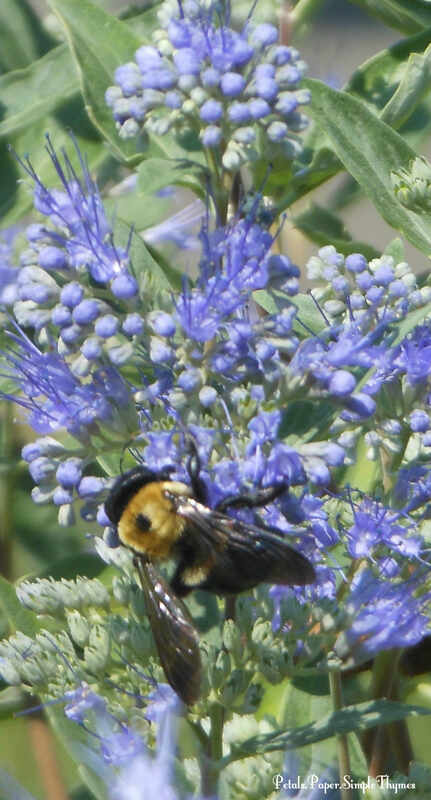 They are now about 15 inches tall, filled with beautiful blue blossoms, and attracting many bees of their own. 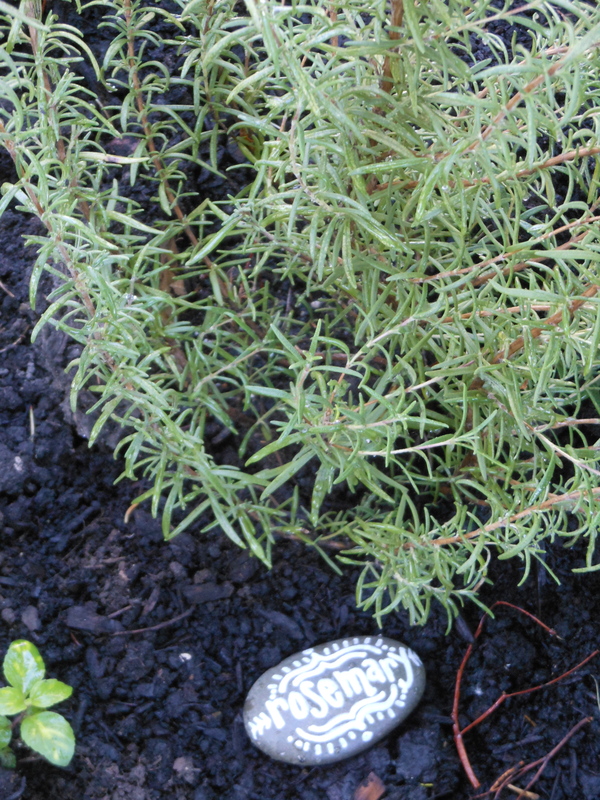 So this morning, I began transplanting the small shrubs to the backyard, along the white picket fence of my Herb Garden. 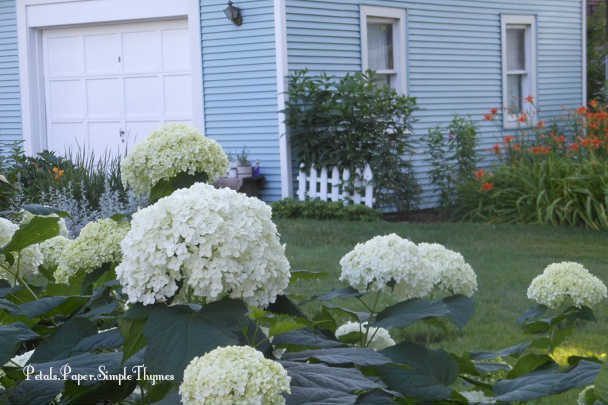 They are such an attractive shrub all year long with their aromatic, gray-green foliage. 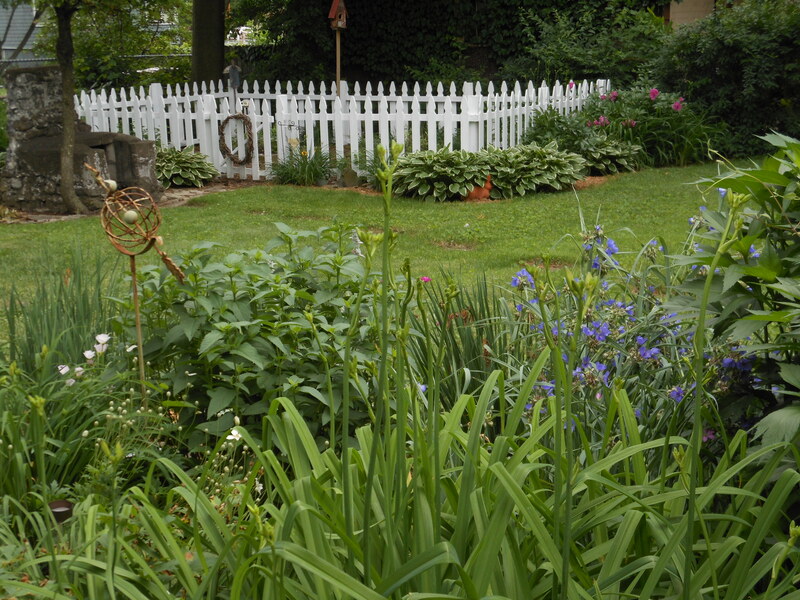 Their woody stems will add interest to the picket fence border garden through the winter months. Most important of all, I hope these shrubs will attract even more bees to my Herb Garden! There is a Bee Bath just inside the picket fence, where the bees can rest upon flat river rocks to sip fresh water. 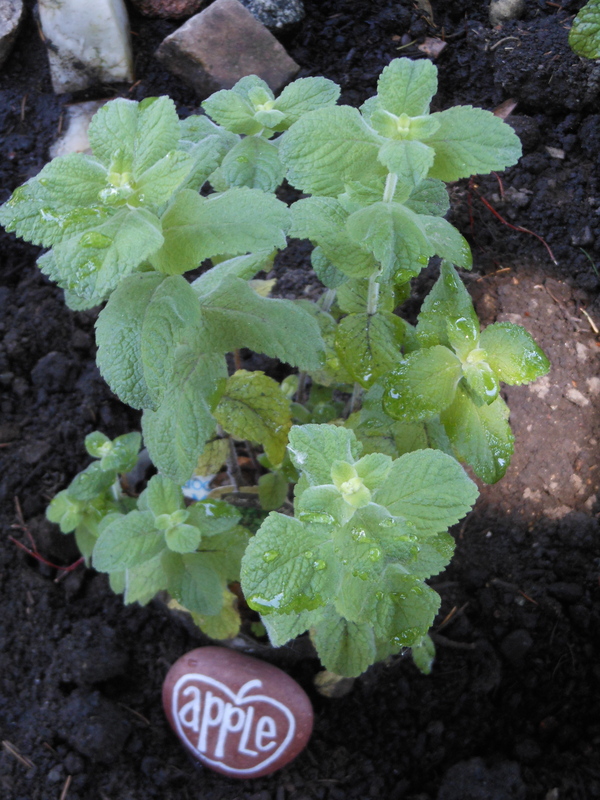 Having a nearby water source will keep the bees happily working in and around my Herb Garden even longer. They won’t have to travel to seek out water. Moving these beautiful shrubs to their new location near the white picket fence should keep the herbs, the bees, and the gardener happy! 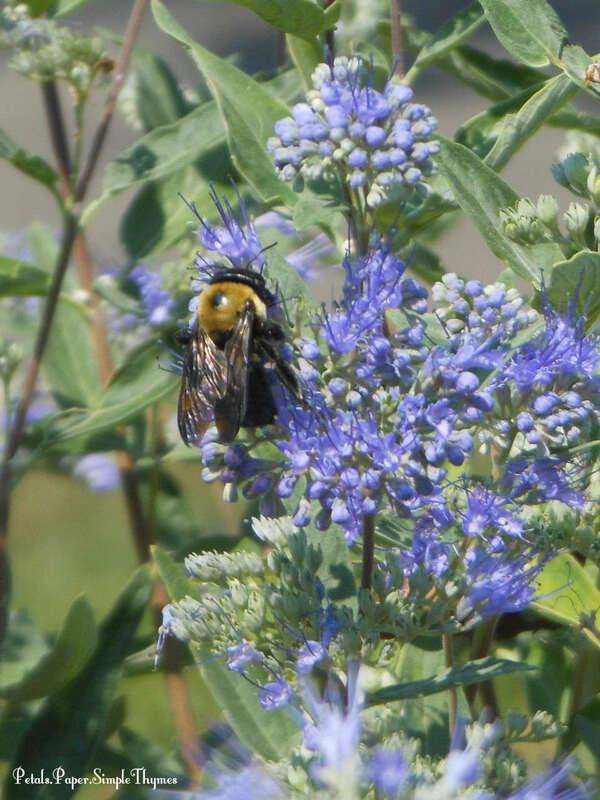 Attracts butterflies, hummingbirds, and bees, bees, bees! 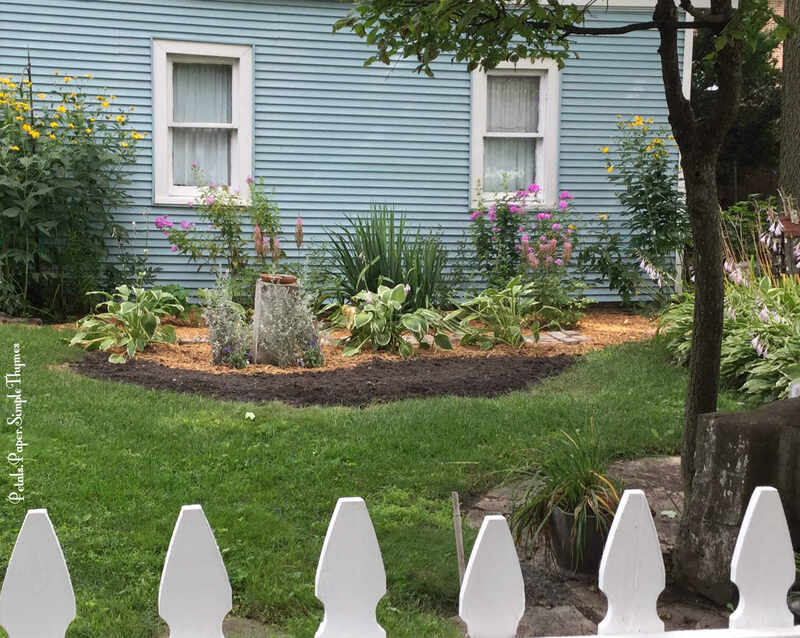 Transplanting the Blue Mist Bluebeard shrubs to the backyard and digging up Rudbeckia plants to share with neighbors this morning created a large, open space in one of our front garden beds. Showy Celosia ‘Intenz’ (also known as Cockscomb) adds bright color and pizzazz! Just yesterday, at the fruit market, a beautiful new plant jumped into our shopping cart. 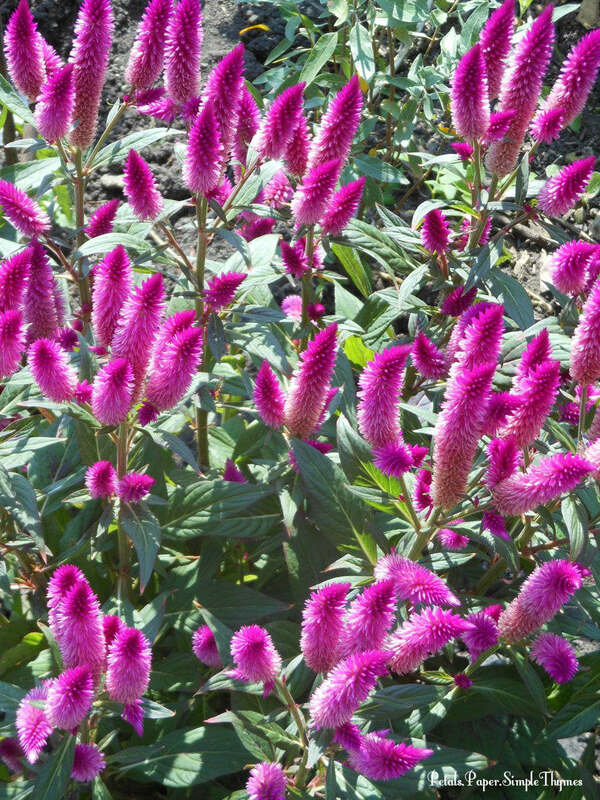 Celosia ‘Intenz,’ with its spiky blooms of brilliant color instantly made me smile! As we walked around in the market, so many other shoppers were smiling at the very same plant in their carts. It felt like we were all part of a secret garden club on wheels! Celosia ‘Intenz‘ is a new, annual plant for this year. It will be fun to enjoy its wonderful blooms in the garden for the remainder of the season. Then I plan to dig it up and bring it inside for the winter. By taking cuttings, I’m hoping to have more new plants for the garden next Spring! Wishing all of our American friends a very happy Labor Day! Thank you so much for stopping to chat by the garden gate today. I always enjoy our visits! P.S. 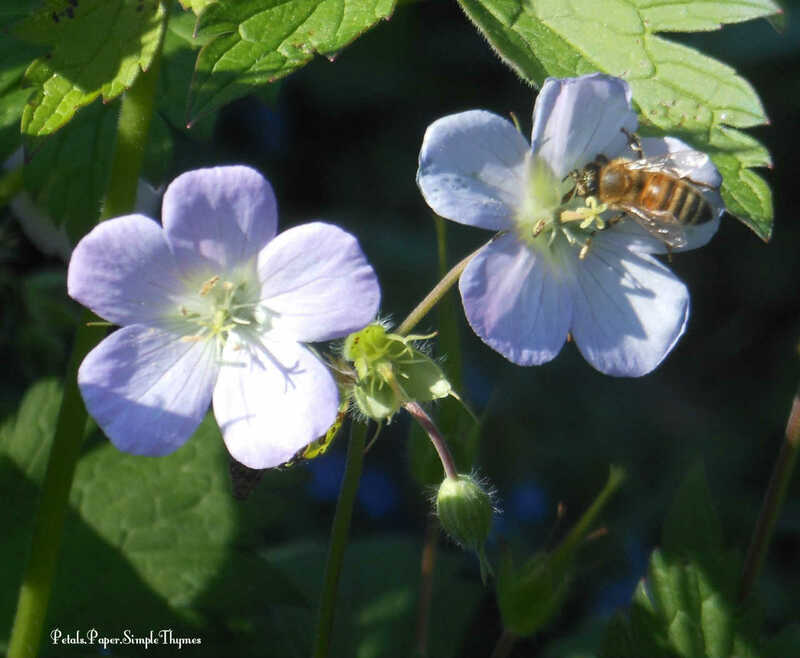 Which plants in your garden attract the most pollinators? Let us know! The Heart of My Garden ~ Built with Love! Our story begins in 1995, when The Summer Book, by Susan Branch was hot off the press. The moment I read it, a new dream began to grow! As a young, single homeowner, nothing made me happier than restoring my little 1922 bungalow, adding my own creative touches every step of the way. My dad (my hero!) has always been there with the knowledge, expertise, tools, and his gifts of time to help make my dreams a reality. Together, we would work on big projects, as he patiently taught me how to plan, measure twice, use all kinds of tools, and choose the very best materials. After my parents retired and moved to Arizona, my dad continued to help me build my dreams! 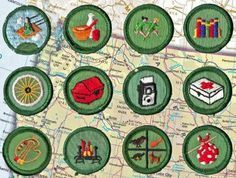 Every Spring, Dad would ask the special question, “What project should we do this Summer?” Then Dad and I would begin to make our plan over the phone. That year, it was different. We wouldn’t be stripping woodwork together, building a pantry, or updating the electricity. 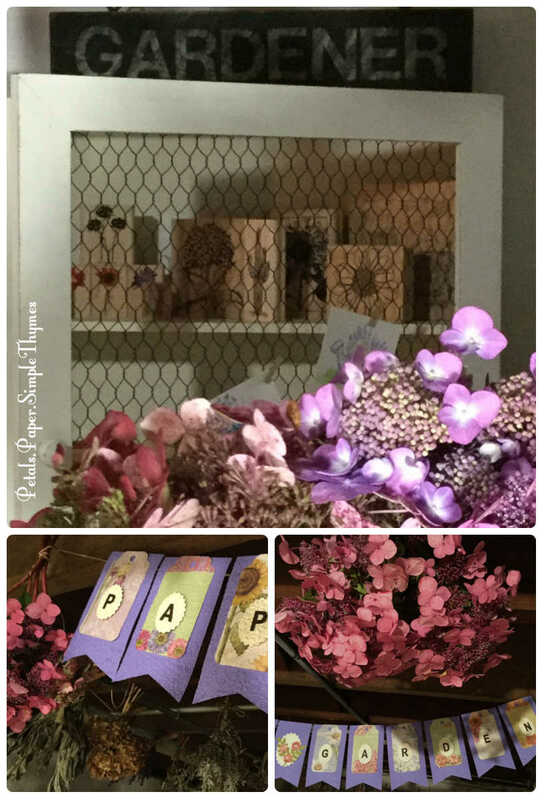 I had a special plan… a dream for my garden! 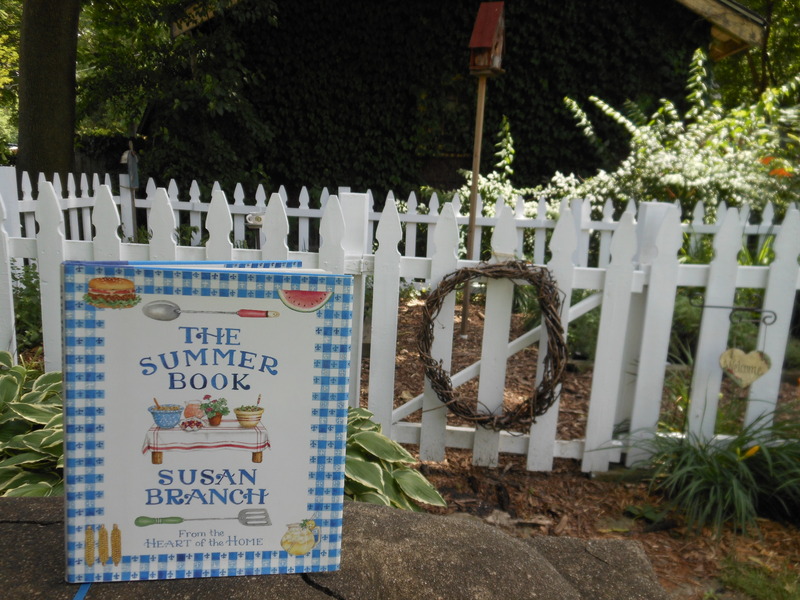 Reading The Summer Book* by Susan Branch was my inspiration! 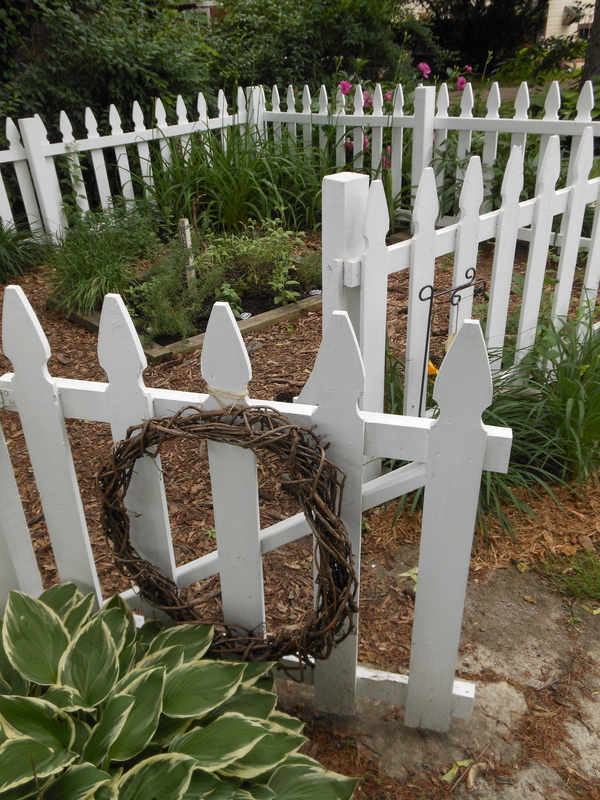 I dreamed of creating an Herb Garden, surrounded by a white picket fence, just like Susan’s Kitchen Garden. *This special book is now out-of-print, but still lovingly sought after by her devoted fans. Keep your eyes open… and you may be lucky enough to find this treasure somewhere! I had just finished reading The Summer Book by Susan Branch. 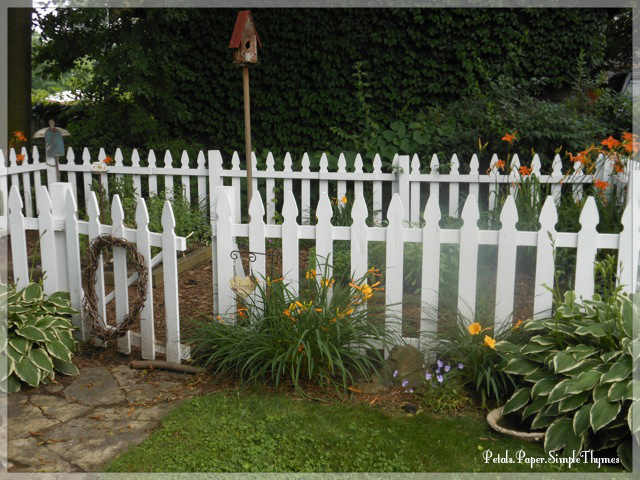 She shared the story of how she wished for a Kitchen Garden, surrounded by a white picket fence. Joe built it for her in their yard on Martha’s Vineyard. 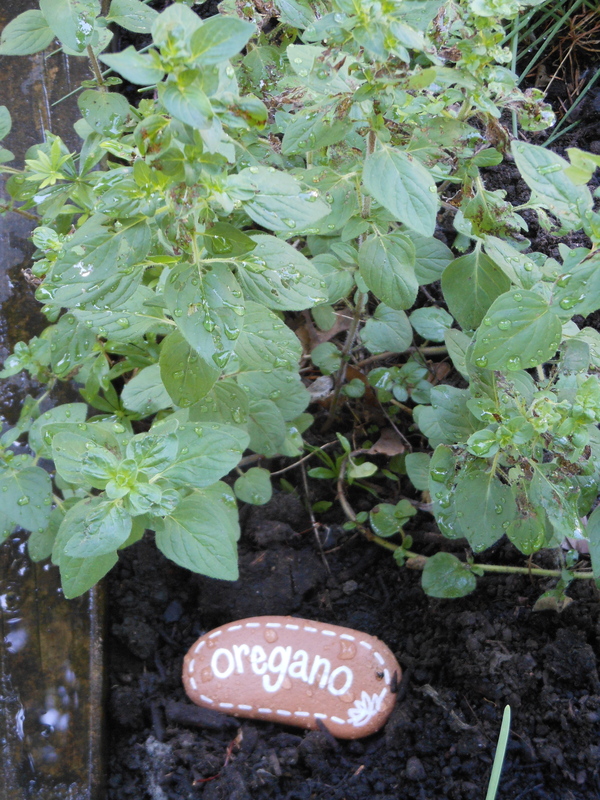 I wondered… Could Dad and I build a special Herb Garden in my yard that Summer? With many phone conversations, our little plan took shape. I chose the location and dug out huge evergreen bushes that filled that corner of my yard. Sawing and digging ~ digging and sawing, day after day. I wanted to have the area cleared by the time that Dad arrived for his Summer visit! Dad shipped the tools we would need all the way from Arizona, so that they would be waiting here upon his arrival. I was so excited that this special dream was coming true! 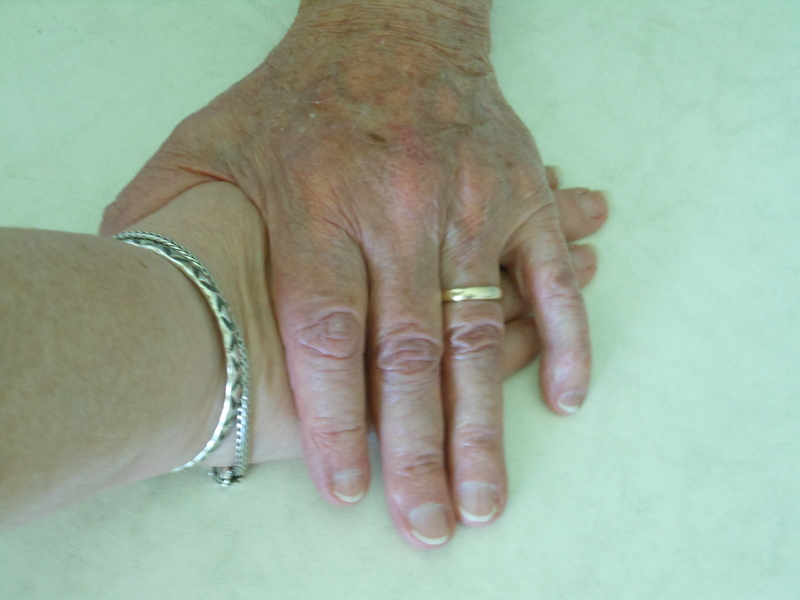 Working hand-in-hand with Dad made my dream come true! We even had time to assemble a garden arbor before Mom arrived in town. She was so impressed to see the lovely additions to my yard! Now there would be relaxing family times for the rest of their Summer visit. What wonderful memories and ‘souvenirs’ we have from the Summer of ’95. Stepping through the garden arbor and garden gate always brings back lovely memories! 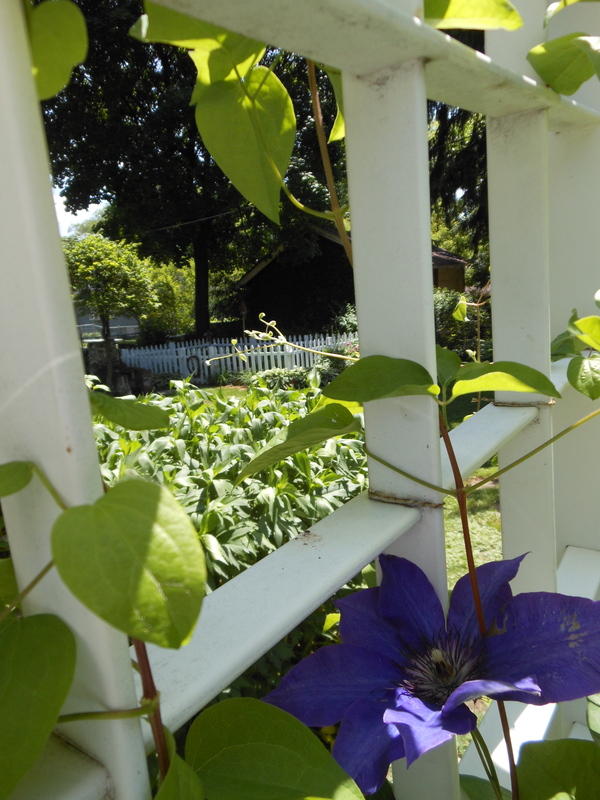 Today is a perfect, sunny June afternoon to peek inside our Herb & Tea Garden. I’ve been busy adding new organic soil to the raised beds. 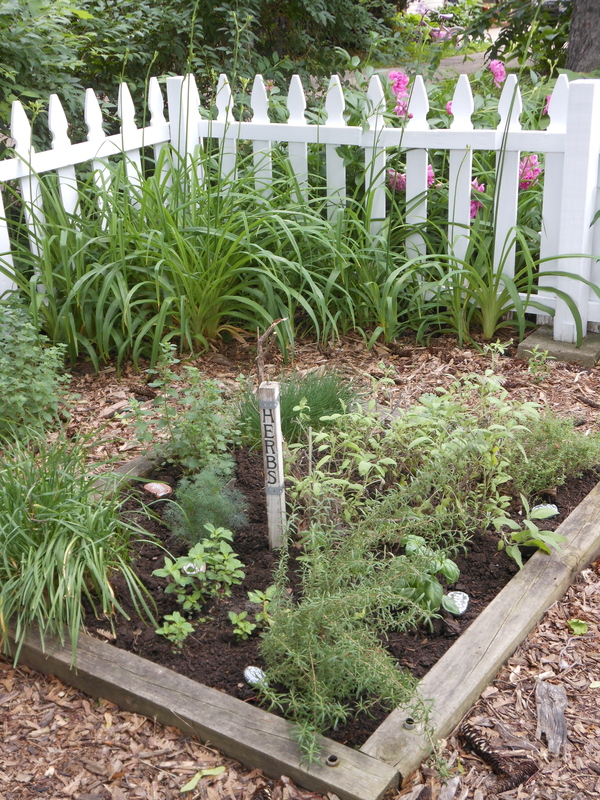 One bed is filled with culinary herbs: Rosemary, Basil, Thyme, Cilantro, Garlic Chives, Oregano, Sage, Chives, Dill, and Marjoram. 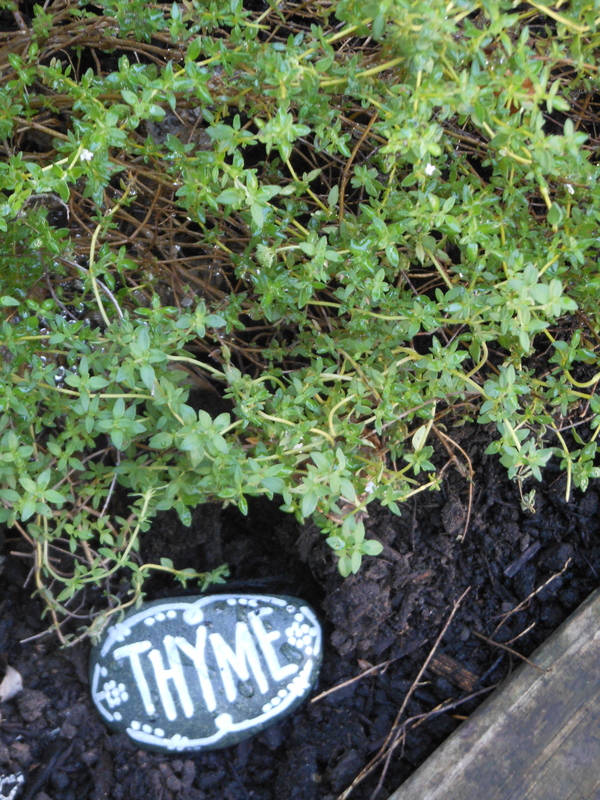 Culinary herbs add a fresh touch to all of our Summer meals. 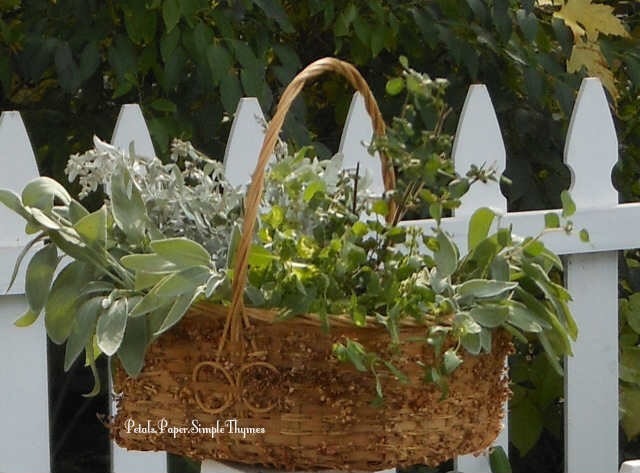 It’s also fun to brush away the Winter snow and gather a few herbs! 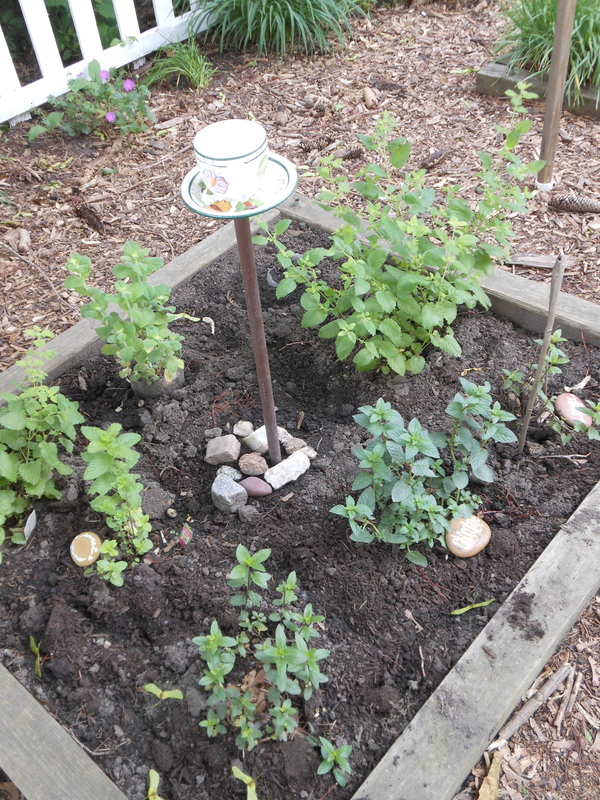 The “Tea” bed is filled with mints and sages to brew fresh herbal tisanes, perfect served hot or iced. 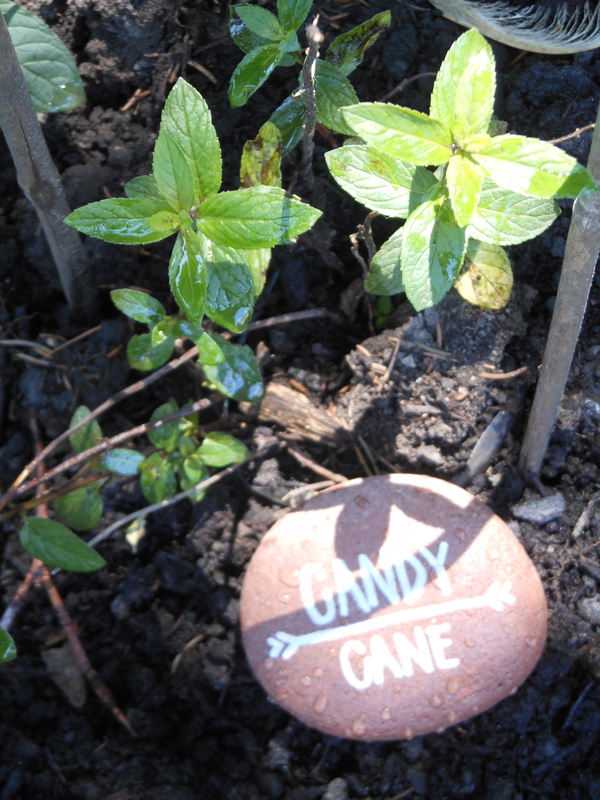 You might enjoy Candy Cane Mint, Peppermint, Apple Mint, Sweet Mint, Chocolate Mint, Lemon Balm, or Pineapple Sage. It’s fun to create your own personal blends, too! It’s always fun to plan Tea Parties. Guests are welcome to wander down the path to our herbal “Tea” Garden to pick a few leaves for their own unique blends! 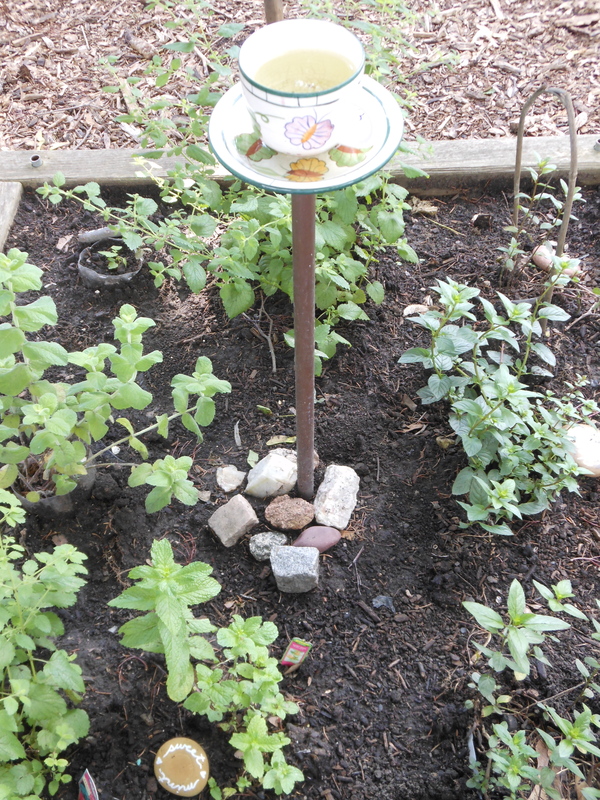 A vintage tea cup (a gift from a student long ago) graces the center of our “Tea” garden. Nestled just below are special rocks collected over the years ~ a cobblestone from Prague, a stone from Bacharach, stones from Red Mountain, and stones from our ‘secret place’ in the Sonoran Desert. 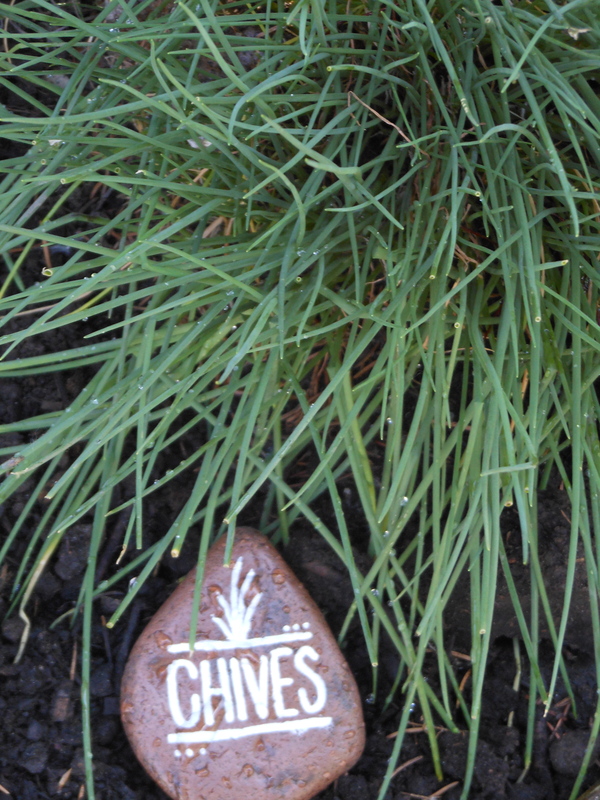 My sweet, talented friend, Kristin, created delightful garden markers from river rocks, collected in New Mexico and Arizona, especially for our Herb Garden. 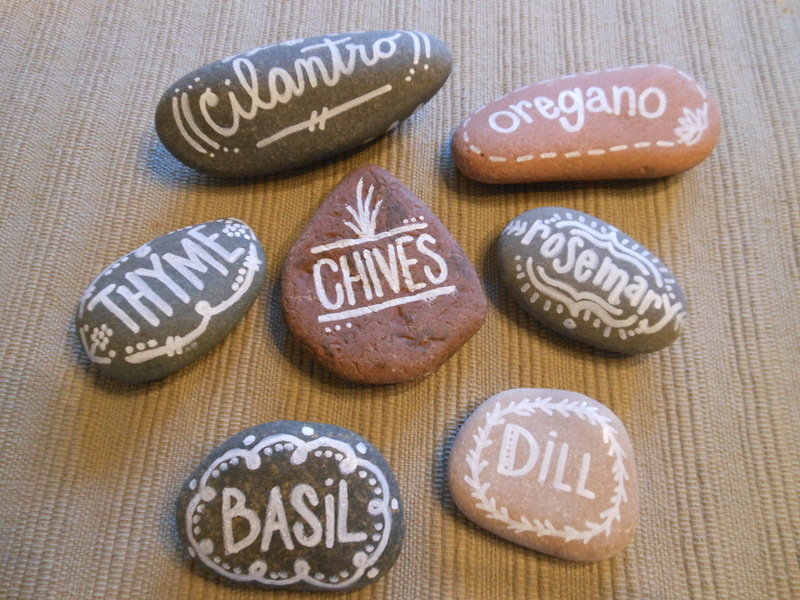 ‘Garden Stones by Kristin’ mark culinary herbs. 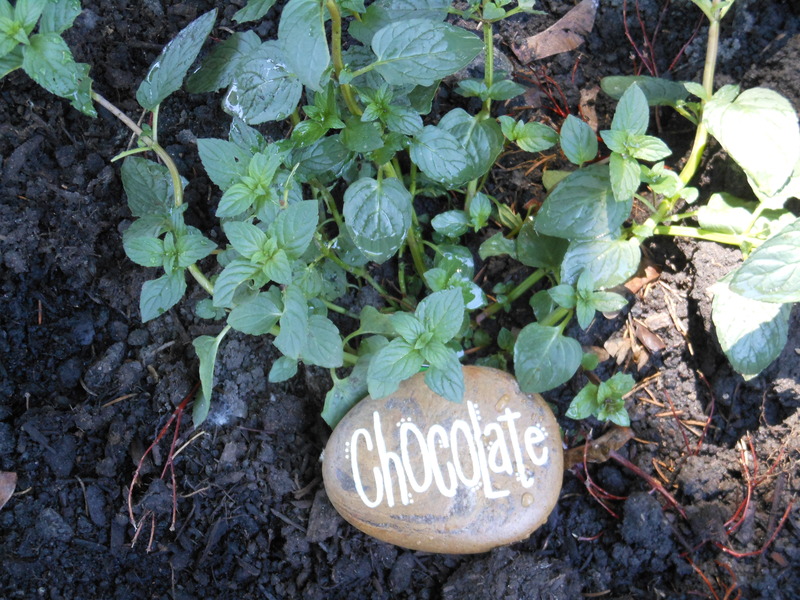 ‘Garden Stones by Kristin’ highlight some of our mints and sages in the “Tea” Garden, too. The magic happens whenever you step through the garden gate and are greeted by the lovely herbal scents. 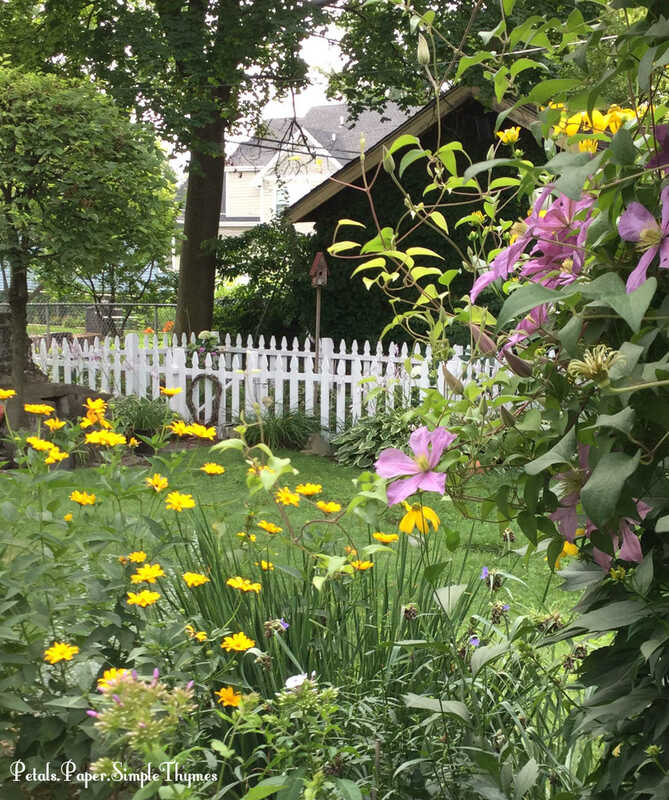 Along the inside of the fence, we enjoy pops of color from Black-eyed Susans, Balloon Flowers, Pincushion Flowers, Daylilies, Cranesbill Geraniums, Daisies, Bee Balm, Obedient Plant, and Chrysanthemums. A rustic birdhouse stands tall in the center of the Herb Garden and a folk art Garden Angel watches over this special place. Bees buzz in and butterflies flutter about all day long. Now I’m in search of the perfect bee skep to add to our Herb Garden. This quiet, little garden is one of my favorite places on earth! My parents just returned to Arizona last week, after another lovely visit with us. We had so much fun reminiscing about the Summer when Dad and I built the Herb Garden together. Each Summer, the Herb and Tea Garden is the ‘heart of my garden.’ My hours spent weeding, planting, and gathering herbs are such sweet times! I always think back to that Summer, so long ago, when Dad and I built this special garden together. Every time I step through the garden gate, it feels like a big hug from my dad! 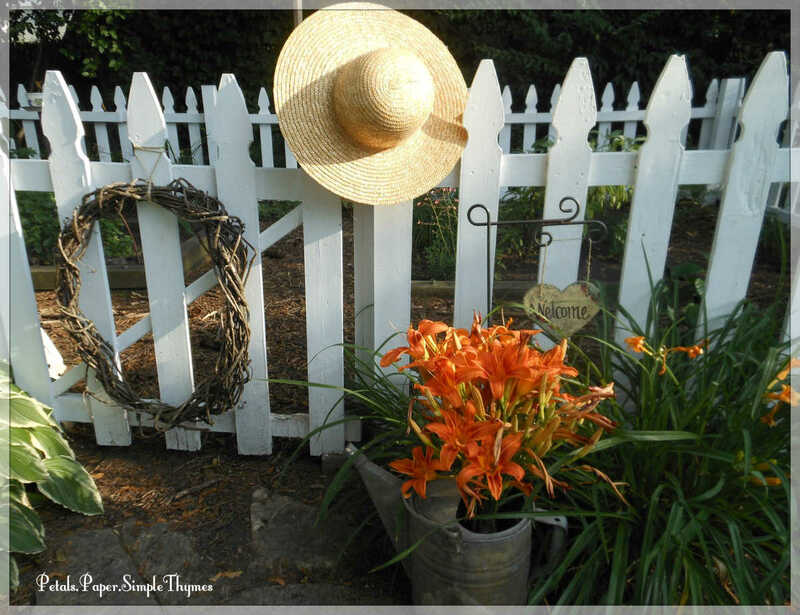 ♡ I will always cherish the hours spent in the heart of my garden ~ built with love! P.S. Which herbs are your favorites? We are having glorious weather here today! I spent the whole morning in the garden ~ weeding, trimming the Quince bush, and pulling out some groundcover that was quickly taking over a perennial bed. As I was working, I thought about two easy, helpful garden tips to share! 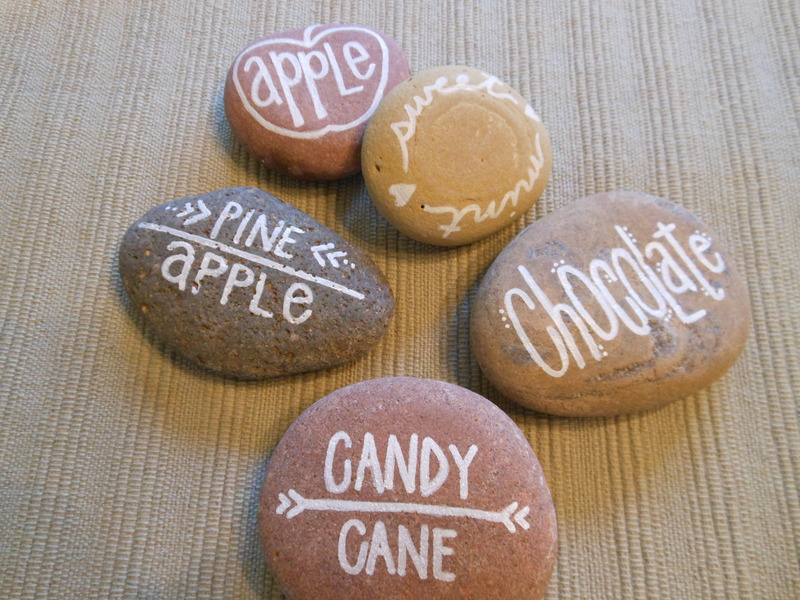 I ‘pinned’ both of these ideas on Pinterest last Spring and couldn’t wait to try them. 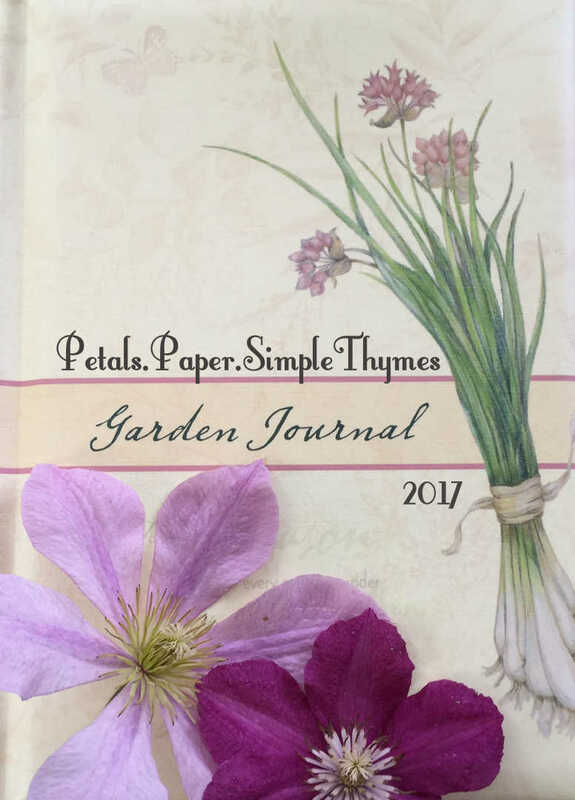 After a whole year of “testing” these ideas, I think they are worth sharing with gardening friends. They worked great in our garden over the past year! Weeds grow quickly on the flagstone patio, surrounding our old stone grill. Typically, I have to pull the weeds growing between the flagstones every few weeks all summer long. There is an easy solution, using something you probably have in your kitchen right now. First, pull the weeds from between the flagstones. Then sprinkle the area with baking soda (Sodium Bicarbonate). You can use the old box that has been freshening your fridge! Water the baking soda into the soil between the flagstones. New weeds will not germinate. (Be careful not to sprinkle the baking soda on desirable plants.) Baking soda also prevents weeds from growing in sidewalk or driveway cracks. It was a great solution to a problem area in our backyard! Hostas grow in many parts of our shady garden. The same Hostas thrive on our shady front porch! 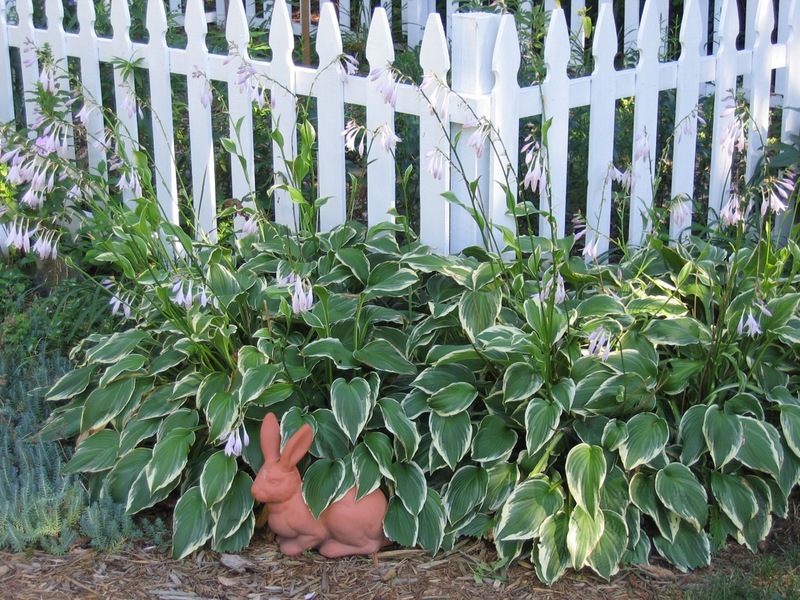 We have Hostas growing in shady areas throughout our yard. 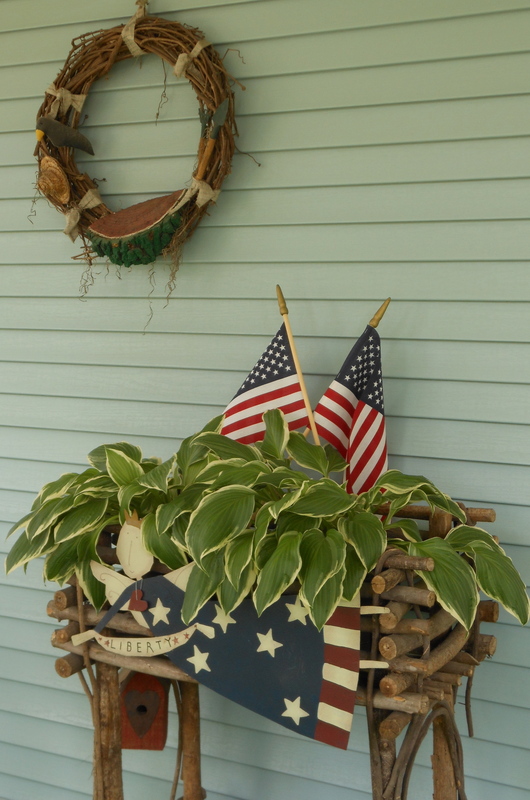 Did you know that Hostas also make great container plants? Last Spring, I dug up Hostas from the yard and planted them in these containers for the front porch. They thrived on our shady porch throughout the summer. When the weather turned cold, I just moved the pots to our unheated garage for the winter. During our extremely cold winter months, I only watered the pots twice. When the weather warmed up in early Spring, the Hostas were already poking up through the soil in their pots in the garage. So, I moved the pots back to the front porch and watered them well. They are growing quickly again this year! I will fertilize them a bit during this growing season. Instead of just filling containers with annuals, it’s easy to grow perennials in containers, too! It’s so nice to use what you already have… with wonderful results! P.S. 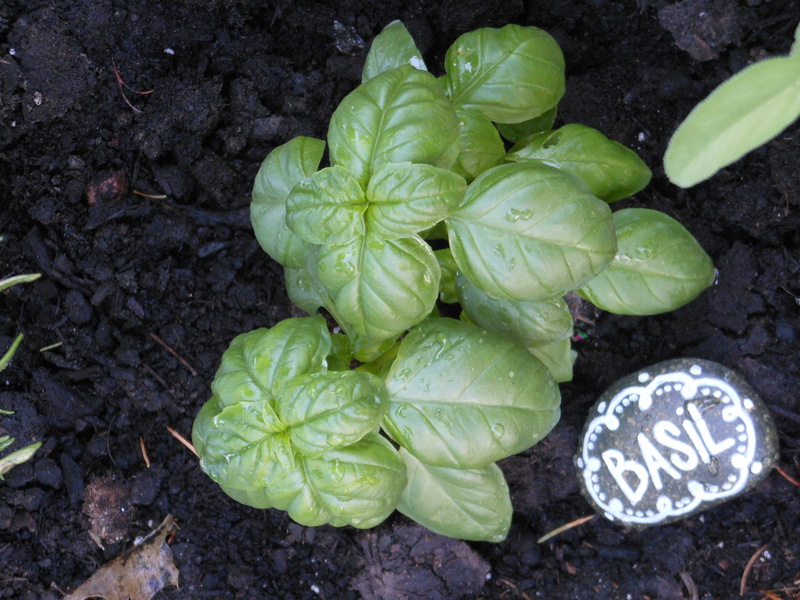 Do you have a favorite tip to share with our gardening friends?